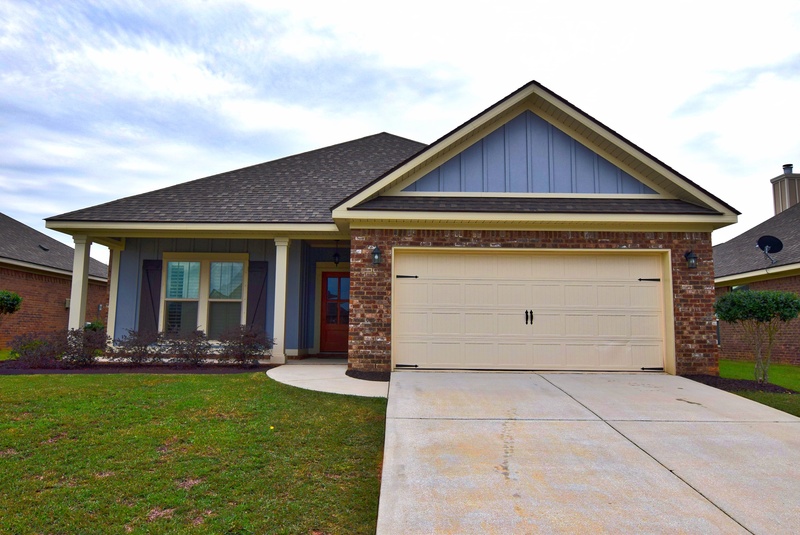 Fabulous, Like-New Home in Beautiful French Settlement Subdivision! Located in the heart of Daphne, AL, 8846 Asphodel Lane is loaded with high-end upgrades coupled with exceptional community amenities. The benefit of a highly rated school district is an invaluable asset to the value of this property. Additionally, enjoy great local attractions such as Alligator Alley, Trione Park, and the Eastern Shore Centre. Not to mention Mobile Bay within one mile, and world famous beaches just a short drive away! 8846 Asphodel Lane, built in 2012, is a traditional style “turn-key” home with three bedrooms and an additional office space. French doors afford extra privacy to the office/den, which is conveniently situated toward the front of the home. Exceptional hand-scraped hardwood flooring extends from the front foyer throughout the office and into the great room. Complemented by 18” angled ceramic tile in the kitchen, dining area and bathrooms, the flooring truly is top quality! All main living areas of the home are enhanced by crown molding, including the trey ceiling of the master bedroom. Recessed and LED lighting, as well as plantation shutters throughout, further highlight the aesthetic qualities of the interior. The open concept floor plan engenders a very connected atmosphere between the kitchen and great room, separated only by a high breakfast bar. Granite countertops, custom cabinetry and Whirlpool stainless steel appliances top off the excellent kitchen features. Also included with the purchase of this property are the Whirlpool washer and dryer. Giving entrance into the spacious backyard is a covered patio, the perfect place for kids to play or to entertain guests. The stained privacy fence and full sprinkler system provide first-rate extra touches to the delightful natural surroundings. Also provided for the residents of the French Settlement community is a sparkling neighborhood POOL and clubhouse. Jason: How did you know this was the home you were meant to buy? Jason: Were schools a factor in your decision to purchase this home? Jason: What have become your top 5-10 favorite features of the home? Jason: Where do you find yourself spending the most time in the home and why? Jason: What improvements have you made to the home or property over the years? Jason: What are your favorite grocery stores and shops in the area? Jason: Any interests or hobbies you enjoy on or near the property? Jason: Average utility costs in summer and winter? Jason: What will you miss most about living in or owning this property, as well as the surrounding community? Tour Truland Homes French Settlement Daphne AL subdivision with the Jason Will Real Estate Team 251-866-6464.